Last week, Portugal-based EDP Renewables filed documents with the Ministry of the Environment and Climate Change (MOECC) as part of the Renewable Energy Approval (REA) process, to get final approval for its “Nation Rise” wind power project in North Stormont, just south of Ottawa. Using every tool they have to act responsibly on behalf of citizens, North Stormont had engaged Ottawa engineering firm Morrison Hershfield to conduct a review of the documents presented earlier. The firm found that key information was missing from the project documents in critical areas such as the impact of the project on groundwater, and on bird and bat populations, to name two. An excerpt from the Morrison Hershfield report, tabled at a late June Council meeting, follows. No review has been completed for potential impacts of the project on potable water sources. While potential impacts to groundwater resources have been reviewed from a biophysical perspective, no review has been completed to assess the potential impacts to groundwater resources from a potable water quantity and quality perspective. • No detailed review has been completed to assess potential effects of the project construction on municipal infrastructure. The consulting firm recommended to Council that North Stormont ask for these reports to be provided, including an assessment of impact on groundwater and municipal infrastructure such as roads. Read the engineering firm report here. There is no information on whether EDP complied with the request from North Stormont before filing project documents to be screened for “completeness” by the MOECC. Citizens in the area are very concerned about the power project. 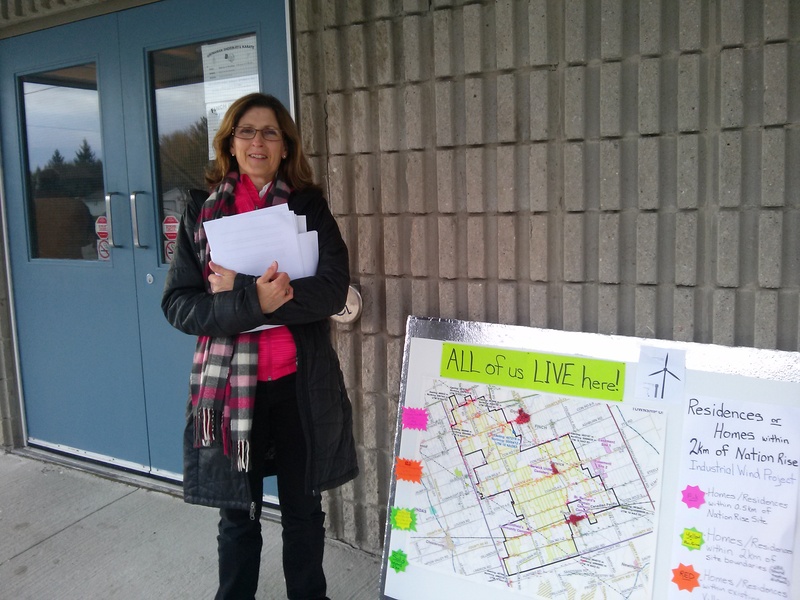 Margaret Benke, a leader with Concerned Citizens of North Stormont, told Ottawa Wind Concerns “You can imagine that with 825 homes within 2km of one and up to 10 proposed turbines, and both Crysler and Finch villages within 3km of multiple turbines, we are bracing for the worst. The group is especially concerned following release of a report by Wind Concerns Ontario in June, showing that the MOECC has failed to respond to thousands of reports of excessive noise from wind turbines. EDP also operates the South Branch wind power project in Brinston; it took over a year to file its required acoustic audit to demonstrate compliance with provincial noise regulations for wind turbines, but there is no report posted on the company’s website. The Nation Rise project will be 100-megawatt capacity using 30-35 industrial-scale wind turbines; Ontario currently has a surplus of electrical power and is regularly selling off extra at below-market prices, and paying wind power generators not to produce in times of low demand and high supply.